Biologically active forms of vitamin D are important analytical targets in both research and clinical practice. The current technology is such that each of the vitamin D metabolites is usually analyzed by individual assay. However, current LC-MS technologies allow the simultaneous metabolic profiling of entire biochemical pathways. The impediment to the metabolic profiling of vitamin D metabolites is the low level of 1α,25-dihydroxyvitamin D3 in human serum (15–60 pg/mL). 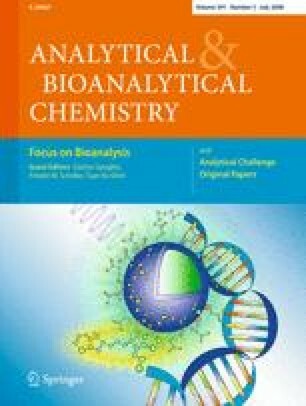 Here, we demonstrate that liquid–liquid or solid-phase extraction of vitamin D metabolites in combination with Diels–Alder derivatization with the commercially available reagent 4-phenyl-1,2,4-triazoline-3,5-dione (PTAD) followed by ultra-performance liquid chromatography (UPLC)–electrospray/tandem mass spectrometry analysis provides rapid and simultaneous quantification of 1α,25-dihydroxyvitamin D3, 1α,25-dihydroxyvitamin D2, 24R,25-dihydroxyvitamin D3, 25-hydroxyvitamin D3 and 25-hydroxyvitamin D2 in 0.5 mL human serum at a lower limit of quantification of 25 pg/mL. Precision ranged from 1.6–4.8 % and 5–16 % for 25-hydroxyvitamin D3 and 1α,25-dihydroxyvitamin D3, respectively, using solid-phase extraction. The online version of this article (doi: 10.1007/s00216-008-2095-8) contains supplementary material, which is available to authorized users. We thank John Newman who provided the UPLC for the initial method development experiments. We thank Theresa Pedersen and Katrin Georgi for discussion of the extraction procedure, Mike Eskander for help with preparation of standards and MS optimization, Alina Wettstein for help with preparation of REACH samples and Leslie Woodhouse and Manuel Tengonciang for 25(OH)D RIA analysis. P.A.A. was supported by NIEHS Advanced Training in Environmental Toxicology Grant T32 ES007059. L.M.H. was supported by NIH Grant P60 MD00222-01. C.B.S. was supported by USDA-ARS Project 5306-51530-006-00D. K.D. was supported in part by BayGene. This research was supported in part by California Dairy Research Foundation Grant 07 HAB-01-NH, Bristol-Meyers/Squibb Freedom to Discover Award, NIEHS Grant R37 ES02710, NIEHS Superfund Basic Research Program P42 ES004699, NIEHS Center grant P30 ES05707, and NIEHS Center for Children’s Environmental Health & Disease Prevention Grant P01 ES11269.